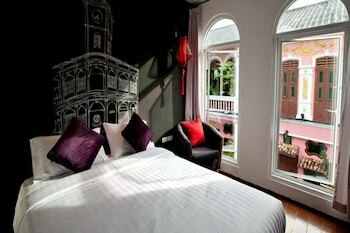 With a stay at The Rommanee Boutique Guesthouse in Phuket, you'll be within a 5-minute walk of Thalang Road and Phuket Baba Museum. The front desk is staffed during limited hours. With a stay at N.P. House Hua Hin in Hua Hin, you'll be a 3-minute drive from Hua Hin Market Village and 6 minutes from Hua Hin Railway Station. Free self parking is available onsite. Located in Ko Sichang, Valentine Home Koh Sichang is a 4-minute drive from Ko Sichang Hospital and 6 minutes from Ko Sichang Lighthouse. The front desk is staffed during limited hours.